If you are a fan of salmon like me, eating it at least once a week, you can never have enough salmon recipes in your repertoire. 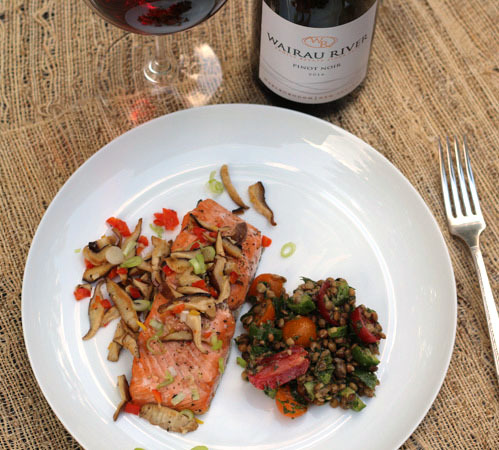 Roasted salmon with shiitake mushrooms paired with Wairau River Pinot Noir is a dinner you can file under delicious, healthy, and quick-cook. Wild salmon whether in season or frozen is my choice over farmed salmon for its exceptional taste, texture, less fat, and fewer calories. The health benefits of salmon are many; rich in omega-3 fatty acids, a high source of protein, vitamin B’s, potassium, lowers inflammation, and overall heart health. But why stop with just salmon? Shiitake mushrooms known for their savory flavor have been linked to fighting cancer, boosting immunity, and lowering cholesterol. Add a side of lentil tabbouleh salad and a glass of Wairau River Pinot Noir and well, healthy and simple never tasted so good. Disclosure: 2016 Wairau River Pinot Noir was provided to me as a sample. All opinions are my own. Wairau River Wines (why-raow) was established in 1978 by Phil and Chris Rose. The family-owned estate vineyards located in Marlborough on the banks of the Wairau River. The region’s soils are shallow and stony with low fertility that promotes moderate vine grow. The climate is maritime with the Southern Alps protecting against prevailing westerly winds and rain. Translucent ruby in color. Medium+ acidity and light+ bodied. On the palate earthy and mineral notes with black cherry, and spice. 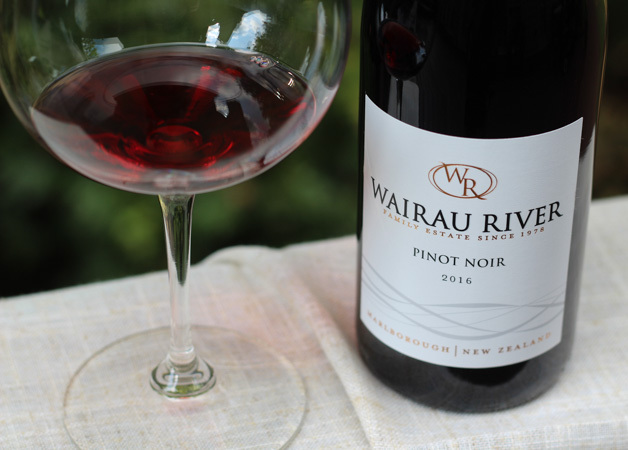 The Wairau Pinot Noir and salmon are in balance with each other in weight and flavor intensity. The earthy and spice notes in the wine are echoed in the shiitake mushrooms, garlic, and ginger. 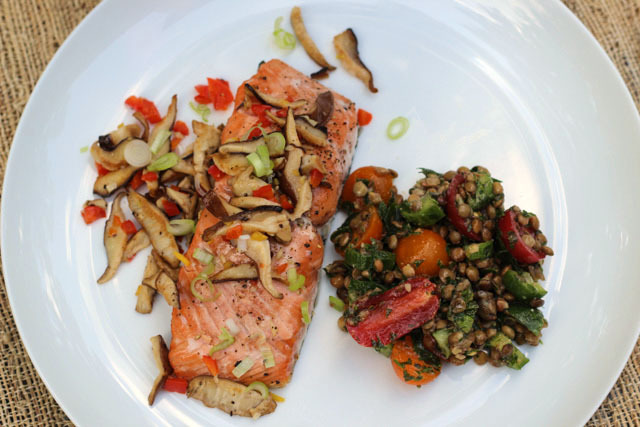 The acidity in the wine cuts through the richness in the salmon and the texture in the mushrooms, leaving the palate refreshed with every bite. A delicious, healthy and quick-cook recipe. Pairs nicely with a New Zealand Pinot Noir like Wairau. Place the salmon fillets on the baking sheet. Squeeze the juice from one half of the lime over the salmon, season with half of the salt and pepper. Roast for 12-13 minutes. While the salmon is roasting, heat the olive oil in a 12-inch skillet over medium-high heat. Add the shiitake mushrooms, season with the other half of the salt and pepper and sauté for about 5 minutes. Add the minced garlic and ginger, sauté for about 30 seconds. Add the red pepper and white wine, stir and reduce the liquid for about 45 seconds. Remove from the heat. 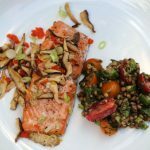 To serve, plate each salmon fillet and top with`1/4 of the shiitake mushroom mixture, a few chopped scallion, and a squeeze of lime juice. Nice dish Jane! Salmon and shiitakes and one of my favorites thus I’m tucking this idea away. Haven’t had many New Zealand Pinot Noir, they’re very hard to get where I live. But hopefully that will get easier… one day.